World powers backed military measures on Monday to help defeat Islamic State fighters in Iraq, boosting Washington's efforts to set up a coalition, but made no mention of the tougher diplomatic challenge next door in Syria. The District and Sessions Judge, Islamabad, has ordered registration of an FIR "in accordance with law" against Prime Minister Nawaz Sharif, Punjab Chief Minister Shahbaz Sharif and Interior Minister Nisar Ali Khan Chaudhry on a complaint by the Pakistan Awami Tehreek (PAC). More than 700 people fleeing Africa and the Middle East may have drowned in the latest shipwrecks in the Mediterranean, bringing the death toll this year to almost 3,000, the International Organisation for Migration said on Monday. Queen Elizabeth II has waded into the debate over Scotland's future as part of the United Kingdom, asking Scots to "think very carefully about the future" before voting in a historic referendum this week. 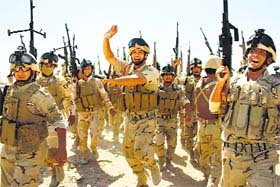 Iraqi soldiers brandish their weapons during a military exercise in Basra. France sent fighter jets on a reconnaissance mission over Iraq, a step closer to becoming the first ally to join the United States in new bombing there since President Barack Obama declared his plans to establish a broad coalition last week. Paris also hosted an international conference, attended by the five UN Security Council permanent members, European and Arab states, and representatives of the EU, Arab League and United Nations. All pledged to help the government in Baghdad fight against Islamic State militants. But a statement after Monday's conference made no mention at all of Syria, the other country where Islamic State fighters hold a wide swathe of territory. Iraq attended Monday's meeting but Syria did not, nor did its main regional ally, Iran. Obama pledged last week to establish a coalition to defeat Islamic State fighters in both Iraq and Syria, plunging the United States into two separate civil wars in which nearly every country in the Middle East has a stake. "All participants underscored the urgent need to remove Daesh from the regions in which it has established itself in Iraq," said a statement after Monday's talks, using an Arabic acronym for the group which now calls itself Islamic State. 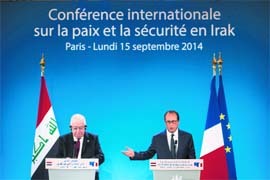 Foreign Minister Laurent Fabius said French aircraft would begin reconnaissance flights over Iraq. A French official said two Rafale fighter jets and a refuelling aircraft had taken off on Monday for Iraq. "The throat-slitters of Daesh - that's what I'm calling them - tell the whole world 'Either you're with us or we kill you'. And when one is faced with such a group there is no other attitude than to defend yourself," Fabius told a news conference at the end of the talks. The PAC had sought registration of the case on charge of murder of its six workers during clash with the police last month while advancing towards the Prime Minister's house and Parliament. Meanwhile Pakistan Tehreek-e-Insaf (PTI ) chairman Imran Khan has said he was foreseeing next elections sometime in coming winter adding that his campaign against Prime Minister Nawaz Sharif was about to culminate in success. The Islamabad police have registered a case against Imran Khan for forcefully securing the release of arrested party workers from police custody. Case No. 201 lodged in the Secretariat police station states that Imran Khan and his accomplices stopped the police vehicle carrying arrested workers while it was on the premises of the police station. Imran got the arrested workers released and left hastily. In the worst incident, as many as 500 migrants are believed to have died after traffickers rammed their ship off Malta's coast last week, an event that only came to light this weekend in testimony from two of the nine survivors. The survivors said the traffickers ordered the migrants to change vessels in the middle of the Mediterranean. The migrants refused, leading to a confrontation that ended when traffickers rammed the ship carrying the migrants, IOM spokeswoman Christiane Berthiaume told Reuters in Geneva. 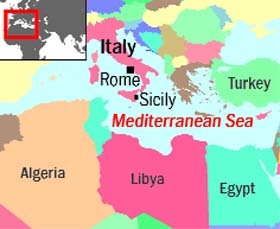 The vessel had set off on Saturday, September 6 from Damiette, Egypt, and sank off Malta's coast on Sept 10th, she said. The UN refugee agency also learned of the shipwreck, but said its information was the wreck occurred on Friday. "In all, nine people survived and were picked up boats," Berthiaume said. IOM officials interviewed two Palestinian survivors who were taken to Sicily, Italy, while other survivors were taken to Malta and to Crete, Greece, Berthiaume said. In a much hoped for intervention by politicians in Westminster, the Queen told well-wishers outside church in Aberdeenshire in Scotland yesterday: "Well, I hope people will think very carefully about the future". It is the first time she has spoken directly on the historic referendum and follows calls from Unionists for her to speak out in favour of a 'no' vote. Last week, Buckingham Palace had warned politicians not to drag her into the battle, after both Labour and Conservative backbenchers urged her to intervene. Aberdeen: British PM David Cameron during a visit to Scotland on Monday warned that if the country voted for independence from the UK, it would not be a "trial separation" but a "painful divorce". "There is no going back from this, no re-run. This is a once-and-for-all decision," he said in Aberdeen in by far his most forceful speech to date ahead of Thursday’s referendum.